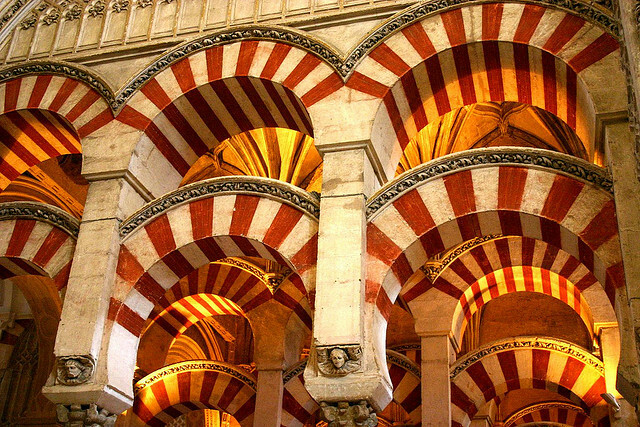 In its heyday Córdoba was the capital of Al-Andalus, the name used to describe Moorish Spain. It was one of the largest and most important cities in Europe, a centre of learning and culture from which important philosophers, scientists and artists emerged. Today it is Spain’s 10th largest city by population with around 320,000 residents yet it feels like a small provincial town centred around a historical centre. 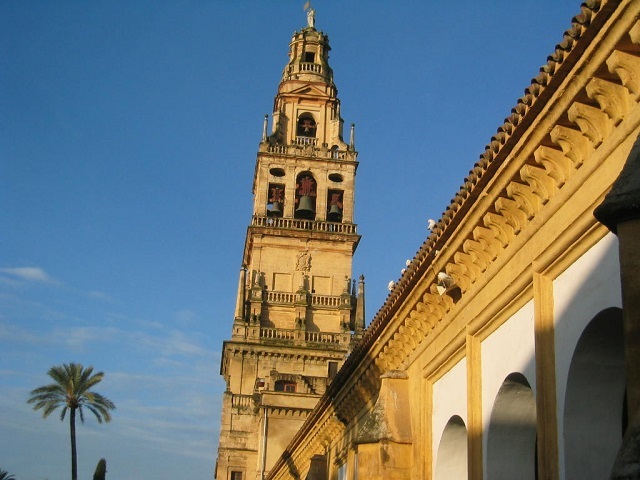 In this Cordoba travel guide you’ll learn how to best spend your time in this beautiful city which is dominated by the magnificent Mezquita – the Great Mosque of Córdoba. This Mosque dates back to 785 and was by far the biggest and most beautiful one constructed by the Moors in Spain. Many years ago a Spanish lady in Madrid informed me that one day in Córdoba was more than enough. How wrong you were Marta! I’ve been returning there year after year ever since and never tire of what is one of the most charming cities you’ll ever find. Of course the Mezquita is Córdoba’s main attraction but in my opinion Córdoba is about much more than just sightseeing. The city has a strong tradition of flamenco, bullfighting and old taverns where the people enjoy their tapas and local sherries. As you wander the myriad of tiny lanes and marvel at the beautiful flower covered patios you will fall under Córdoba’s spell. I’ve never found anywhere more atmospheric where you can simply wander around, losing yourself in the tiny streets of the historic centre whilst stopping off for a break in local tapas bars. It’s so easy to fall in love with Córdoba and find yourself wanting to return time and time again. The weather in Córdoba is usually beautiful but do bear in mind that this is the interior of Andalucía. Just 55km south-west is the town of Écija which is known as ‘La Sartén de España’ (the frying pan of Spain) where summer temperatures as high as 48°C have been recorded in the shade. Avoiding Córdoba in the peak of summer is usually a good idea. Summer temperatures can reach 40ºC in Córdoba during the day and the streets tend to be empty during the hottest part of the day. The heat does ease off in the evening when people go outdoors until late. Winter temperatures rarely fall below 5ºC but it can be a bit wet at times during these months although clear sunny days are never far away at any time. Below is a 4 day weather forecast for Córdoba. Under it you will find two graphs showing the average monthly temperature and rainfall throughout the year. You can fly to Malaga (2½ hours away by road) or Seville (1½ hours by road) then drive to Córdoba. Alternatively, you could fly to Madrid then take the high speed AVE train to Córdoba. Car rental at Malaga or Seville airports is usually good value and permits maximum flexibility on your visit. The drive from both airports to Córdoba is relatively straightforward but getting around in the historic centre is complicated and parking can also be a problem. A more expensive option is to book a car with driver to take you from Malaga Airport or Seville Airport directly to Cordoba. Córdoba is a popular year round city break destinations attracting many Spanish and overseas visitors every weekend and public holiday. During Semana Santa (Holy Week) and other major festivals it’s almost impossible to find a room at short notice. Below we have listed a few of our favourite hotels in the city, most of which are ideally located in the heart of the historical centre near the Mezquita. The Hotel Amistad is a great place to stay thanks to its ideal location which allows you to walk to the Mezquita in just a few minutes through the quaint streets of the historical heart of the city. It’s a lovely, modern hotel built in what were originally two 18th century mansions. It is our top recommendation. Beautiful Image of the Walls of the Mezquita at dusk. There is nothing more you can ask from a hotel if location is your key requirement as the Conquistador lies on the central square of Córdoba’s historical centre with the walls of the Mezquita just 10 metres in front of the entrance. A fine choice. The elegant four star Hotel Alfaros is situated close to the town hall, the historic and artistic centres of the city and the main shopping areas. This excellent hotel is located approximately 10 minutes from the city centre and is the perfect choice for those looking to relax in peaceful surroundings after a day’s sightseeing. Located in the outskirts of Córdoba approximately 10 minutes drive from the centre this hotel is set in peaceful surroundings. The rooms are spacious and light with large comfortable beds and all contain a bowl of fresh fruit. There is a swimming pool in the gardens and a free gym only 300 metres away. The Parador of Córdoba lies at the foot of the Córdoba mountain range. It is a relatively new building situated on the ruins of the small summer palace of Abderramán I. 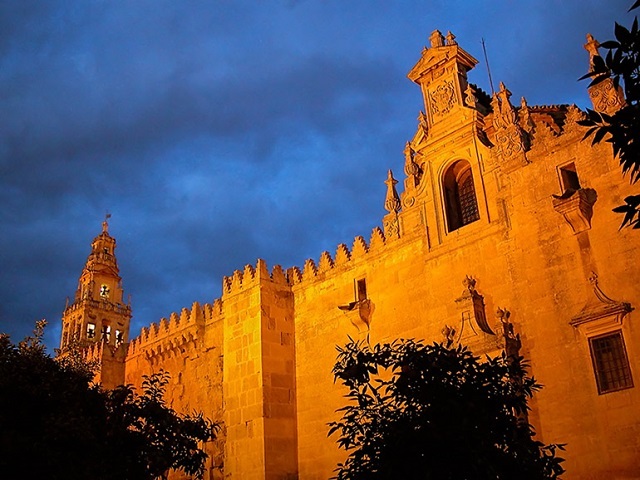 From the Parador there are splendid panoramic views over the whole city of Córdoba but something to bear in mind is that the hotel is located some 3km from the historical heart of the city so isn’t an ideal choice unless you’re happy to travel back and to by taxi. Situated on the opposite side of the central square to the Conquistador, this 3 star option is a superb choice lying right next to the Great Mosque. This hotel is perfectly located in the old Jewish quarter in the heart of the historic area of Córdoba. It has a traditional central patio which is decorated in both Arabic and Andalusian style. All rooms have satellite TV and many have balconies. Although not in the very centre of Córdoba this hotel is a very economical choice. It is about a 10 minute walk from the historic area, 5 minutes from the Ave train station and is very quiet and clean and has a comfortable atmosphere. You can wander around the tiny streets of the Judería (Jewish Quarter) with their flower filled patios. Here you’ll come across one of the last three remaining Synagogues in Spain, the others being in Toledo. You must visit the beautiful gardens of the Catholic Kings (Alcazár) where Columbus first sought finance for his voyage of discovery from Fernando and Isabella. And a stroll across the Roman bridge past the Moorish waterwheels to the other side of the Guadalquivir river is a great spot for a panoramic view of the historical heart of the city which is particularly beautiful at sunset. Belltower standing above the original minaret of the Mezquita. Mezquita / Córdoba Cathedral: Córdoba’s Mezquita is the grandest and most beautiful mosque ever constructed by the Moors in Spain. It stands right in the centre of the city, surrounded by the old Jewish and Moorish quarters. When the Christians reconquered the city they were so overwhelmed by its beauty that they built the Cathedral within the Mosque. Without fail, every Cordoba travel guide will wisely advise you to make sure that a visit to the Mezquita is the focus of your visit. Alcazár de los Reyes Cristianos: It was here that Columbus first requested funding for his renowned journey. The beautiful gardens of the Alcázar are well worth a visit. The buildings were the former residence of the Inquisition and today host one of the largest complete Roman mosaics in existence. Judería: At the heart of the tiny streets which make up Córdoba’s old Jewish quarter is one of Spain’s few remaining synagogues (c/Maimónides 18). Only three survived the Jewish expulsions of 1492. Plaza del Potro: This quaint old square is mentioned in Don Quixote, apparently Cervantes himself stayed at the inn opposite. A pleasant break from the summer heat having a drink under the orange trees. Arab waterwheels and Roman bridge: These lie on the river just south of the Mezquita. Over the bridge, the Torre de la Calahorra houses large scale models of the Mezquita with audio guide explanations of its history. Plaza de la Corredera: The ayuntamiento (town hall) building lies on the site of a ruined Roman temple which is under constant restoration. Nearby the Corredera has undergone impressive reconstruction in the last few years. This square has been a Roman amphitheatre, the site of Inquisition burnings, a bullring, a hangout for Córdoba’s druggies and is now the city’s answer to Madrid’s Plaza Mayor where thousands of people flock to on New Years Eve to see in the New Year. If you’re also visiting Seville you should go to see a flamenco performance there rather than Córdoba as there’s more choice and quality available. You’ll find the best and most authentic flamenco in town at Tablao Cardenal next to the tourist information office opposite the west wall of the Mezquita. Entrance ticket includes one drink with performances beginning at 10.30pm. There’s a flamenco performance every evening at 9pm in what originally served as the Moorish baths (Baños Arabes de Santa María). There’s only room for 20 people so you should book in advance preferably with the dinner option although you can just choose to just have a drink during the show if you prefer. 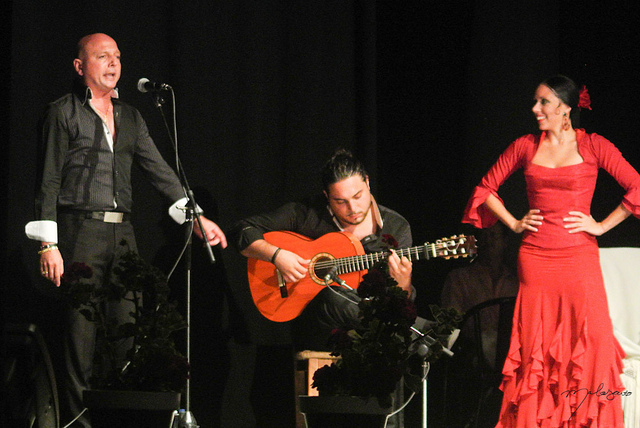 Small scale flamenco performances in a venue almost opposite Taberna Salinas and near the Plaza de la Corredera. Food and drink prices are slightly above normal bar and restaurant prices. This works out as better value than Tablao Cardenal but the show is less of a spectacle. Shows start at 10.30pm. Córdoba was the first place that I truly fell in love with the world of Spanish Fiestas and gained the inspiration to start work on this website. It was during a visit for Semana Santa (Holy Week) from Madrid when the whole city seemed to be outdoors watching the processions as they slowly move around the atmospheric streets of Córdoba. The whole experience can only be described as magical. To this day I try to get to my favourite Andalucian city as often as possible around Easter time to experience the warmth of the city and its people. For a full list of annual events please refer to our Córdoba Festivals Guide. Be sure that you know the difference between ‘tapas’ and ‘raciónes’ before heading out for a tour of Córdoba’s tapas bars …. In English we use the word tapas irrespective of the size of the portion of food we are describing. In reality you are more likely to order “una ración de ..” as this is larger than a “tapa” and more suitable for sharing. A couple of local specialities worth looking out for are Salmorejo (a thick gazpacho-like dip with jamón serrano and egg on top) and Rabo de Toro (oxtail stew). The local barrelled wine which you’ll notice in the older tavern bars is well worth trying. It is called Montilla-Moriles and comes from the towns of the same name just to the south of Córdoba. It tastes like a dry sherry but is not fortified. Just off the Plaza Corredera. This century-old taberna is a superb tapas restaurant. A great selection of excellent raciónes. Great salmorejo – a thick Cordobés gazpacho dip. Very popular with locals so expect to wait a while at the bar before eating. A good lunchtime stop in the town centre just a minute from the . Serves excellent raciónes on the two floors of their newly renovated premise. In a tiny street near the synagogue this is a tremendous bar to try a Moriles. The walls are covered with bullfighting memorabilia and the clientele is often as charismatic as the place itself. A very popular tapas bar/restaurant just off Plaza del Potro opposite Hostal Maestre. A fine selection of tapas with a menu in English. Try the montilla. This is a small tapas bar with a restaurant at the back. Sit inside and order ½ raciones which are a good enough size for two people. This is a great place to sit out in a quiet street taking in the atmosphere. Legendary bar located north of Plaza Tendillas in behind the church of San Miguel. Offers some excellent raciónes and popular with locals. Check out the other bars around the same square. Along Calle Lineros you soon come to the quaint Plaza del Potro. Opposite this plaza on Calle Enrique Romero de Torres is Taberna el Potro which is an ideal place for refreshments. Two more bars with terraces lie alongside offering a wide range of meals and raciónes. You must choose your restaurants carefully in Córdoba as there are plenty overpriced tourist places that aren’t worth the effort. On the whole, however, you’ll find a great selection of excellent restaurants many of which offer dishes which are heaviy influenced by Arab cuisine such as the popular Garbanzos con Espinacas (chickpeas with spinach). Located right next to the Mezquita and one of Córdoba’s most famous restaurants. Typical Cordobés cuisine with its Moorish influence is the speciality of the house. Favourites include cordero a la miel (lamb cooked in honey) and rabo de toro (oxtail). The red wine of the house is excellent. One of the city’s most famous restaurants whose speciality is churrasco (a grilled pork dish, served with pepper sauces) and salmorejo (a thick Córdoban version of gazpacho). This is a classy restaurant at reasonable prices. Next to the tourist information office this restaurant comes highly recommended for a wide variety of meals from the a la carte menu and the platos combinados. Facing the Mezquita. One of the few worthwhile places in this area offering a wide range of mid-priced meat and fish dishes. Córdoba tends to be a stopover for visitors heading for Seville or Granada so few people are actually looking for day excursions. The majority of visitors are happy to take a city walking tour then they move on to Seville or Granada. The most impressive nearby excursion is to the archaeological ruins of Medina Azahara which lie 8km from Córdoba. This site dates back to the 11th century and was constructed by over 10,000 builders and briefly became the capital of the Caliph of Córdoba under Abd ar-Rahman III. However, it was soon destroyed by Berber soldiers. Although it remains under constant excavation it is well worth a visit. There are coach trips available which you can book through the main tourist office opposite the western wall of the Mezquita. If you have your own transport it’s worth visiting Medina Azahara then continuing on to see the medieval castle at Almodóvar del Río. If you’re heading for Seville you can visit Medina Azahara and Almodóvar del Río then continue along the inland A431 to Lora del Rio. From here you vere off onto the A457 which takes you to Carmona on the main A4 motorway to Seville. Visit Carmona: Carmona stands on a fertile plateau dominating the lower Guadalquivir Valley just 30 kms from Seville. Its origins can be traced back to the Neolithic period and throughout history it been an important population centre. Carthaginians settled here in the 3rd century BC locating their town on a former Iberian settlement. Carmona was a major Roman town and even today its town planning is clearly Roman in style. Roman remains include a road (the Augustan Causeway), a Roman bridge and two defensive gates (Seville and Córdoba). However, by far the most outstanding Roman monument is the necropolis, or Roman burial ground. This was discovered and excavated at the end of the 19th century. It consists of over 900 family tombs which date from 2BC to 4AD. The tombs have maintained a large number of paintings in typical Pompeian style showing birds and fruit. There are two particularly outstanding tombs that stand out. The elaborate Elephant Tomb (Tumba del Elefante) next to which you can see a bath, kitchen, benches and banquet table which show how families celebrated the death of their relatives. The Tomb of the Slave (Tumba de Servilia) is even more impressive as it is on two floors with columns and a wide patio. Carmona maintained its importance during Muslim rule and became an independent Taifa (small kingdom) after the fall of Cordoba. In 1247 Carmona surrendered to King Ferdinand III (“the Saint”). King Pedro “the Cruel” liked Carmona and built a royal residence there. Today this is the Parador hotel. Parador of Carmona: This is the best place to stay in Carmona and even if you’re not staying it’s worth a visit just to have a drink and take a look across the fertile plain below planted with sunflowers, barley and wheat. There are splendid views of the fortress from the parador’s swimming pool as well as landscaped areas and a courtyard with a Mudejar fountain. If you’re heading towards Granada from Córdoba with your own vehicle then do yourself a favour and take the inland route through olive oil country rather than following the main highway. Spain produces and consumes more olive all than any other country in the world. This is a picturesque journey cross country from travelling through the premier olive growing province of Jaen. Leave Córdoba on the N432 heading south-east and very soon you’ll see nothing but olive trees across the whole landscape. In Andalucia there are an estimated 165 million olive trees. The appearance of these trees varies as you travel the region because there are 262 varieties of olives. The harvest takes place between November and February and given the nature of the terrain is still a mainly manual task. Espejo is the first town you come to on this route. 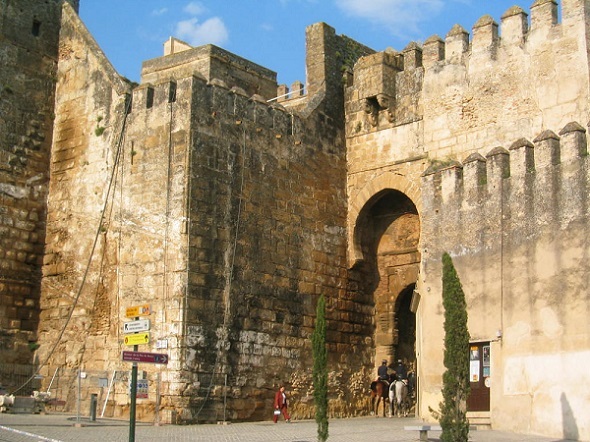 It is notable for its impressive 14th Century Moorish Castle. Castro del Rio is the next sign of habitation, a town with a long history. The Moorish castle was constructed on the foundations of a former Roman fort. A Roman bridge still stands in the town. The town hall building houses a former prison where Cervantes was wrongly locked up for a week after being accused of tax fraud whilst working there as a tax collector. Baena is the largest town en route and acts as the centre of the region’s olive oil industry. Olive oil was interestingly introduced to the Iberian Peninsula by the Greeks and the growing of olive trees was developed by the Romans. The arrival of the Moors lead to improved agricultural techniques and alternative culinary and medicinal uses. La Subbética Cordobesa:Other towns of interest in this area known as the Subbética which are off this main route include Luque, Zuheros and Priego de Córdoba. The villages of Montilla and Moriles are of great regional importance thanks to the thriving wine industry which is centred there. Alcalá la Real which is home to a Moorish fort which has been reconstructed as Castilla de la Motta.